Senate Majority Leader Mitch McConnell joked about a potential “attendance problem” in the Senate due to the half dozen Democratic presidential hopefuls. 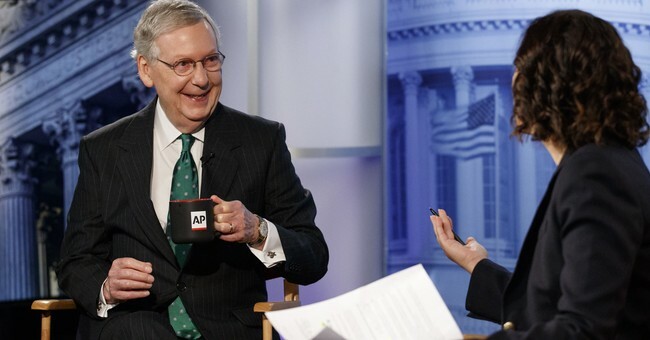 Fox’s Dana Perino asked McConnell during an interview Wednesday how the high number of Democrats with presidential aspirations might affect the Senate that McConnell has retained control of following the 2018 midterms. "Schumer may have an attendance problem as he looks around to see who's in town when they're not in Iowa and New Hampshire,” McConnell replied, “and we do apparently have a lot of Democratic presidential wannabes here in the Senate. It'll be interesting to see what they're up to." Those with presidential aspirations for the Democratic presidential nomination in the Senate include Sens. Elizabeth Warren (MA), Cory Booker (NJ), Kamala Harris (CA), and Bernie Sanders (VT). While Harris, Sanders, and Warren have all indicated that they have not ruled out a presidential run, Booker recently said that it would “be irresponsible” of him not to consider a presidential run. However, despite the opinions of “Spartacus” and others on potential runs for president, a new poll indicates their bids may fall flat. A new Hill.TV American Barometer poll of 680 registered Democratic and independent voters found Wednesday that "none of the above" was the most popular choice among these potential 2020 challengers in the Senate as well as others. Thirty percent of those polled said they would prefer "none of the above" become the Democratic nominee after being asked to choose among former Vice President Joe Biden, Sen. Warren, Sen. Sanders, Sen. Booker, Sen. Harris, former New York City Mayor Michael Bloomberg and former Secretary of State Hillary Clinton. Biden was the next most popular choice with 25 percent saying he would be their preferred nominee and Sanders came in third with 18 percent.